NEXUS, like everyone else, is heading “back to school” this month. Beginning on September 30th NEXUS is performing and giving workshops at the University of Windsor in Windsor, Ontario, including one tailored especially for High School students. (further details below). Then, after kicking off the Windsor Symphony’s Masterworks Series on October 3rd, they travel to Bowling Green State University in Bowling Green, Ohio, where they will present a master class and clinics on October 6th and 7th, finishing off with a performance in Kobacker Hall on October 8th. The September 30th performance at the University of Windsor is the opening of the University’s Gallery series, and will take place in the Assumption University Chapel at 400 Huron Church Road at 7:30 p.m. (The chapel is upstairs so use the entrance on the north side of the Assumption University building for easy access). Assumption University has a history that dates back to 1855, and the handsome chapel wing was completed in 1908. It will be an ideal spot to hear NEXUS as it is considered an “acoustical gem”. The university-level master classes and workshops at the University of Windsor take place during the day on Thursday, Oct. 1 in the Lambton Tower and the School of Music. Some of the work that evolves out of the workshops will be presented in a concert given by the students. The High School student percussion masterclass takes place on Saturday, Oct. 3 at 2:00 pm, and is FREE. If you are interested you should sign up right away, as space is limited. 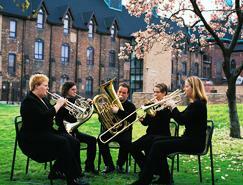 You can read more about music at the University of Windsor here. In Bowling Green, Ohio, Kobacker Hall is in BGSU’s striking Moore Musical Arts Centre. (You can take a virtual tour of the centre here.) 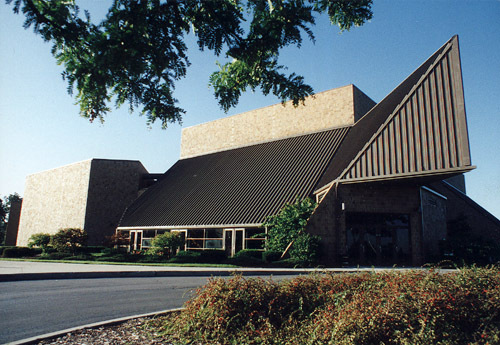 The Kobacker is the largest recital hall in the University’s College of Musical Arts. You can read the story of Marvin Kobacker’s legacy here. You should also check out the Musical Arts Center “To Live Out Loud” mural painted by Joan McKee. We hope you will have a chance to join us at these events! NEXUS to perform in Windsor, Ontario and Bowling Green, Ohio | Images and all! !